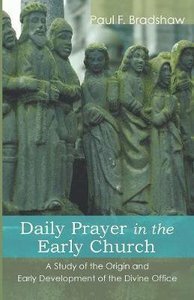 About "Daily Prayer in the Early Church"
Paul F. Bradshaw (Ph.D., Cambridge University; D.D.,London University; D.D. honoris causa, Oxford University) is Professor of Liturgy and Director of the London Undergraduate Program. He has written or edited over twenty books and has contributed more than eighty articles or essays. His book, The Search for the Origins of Christian Liturgy, has become a standard textbook. Other recent publications include: The Apostolic Tradition: A Commentary (with Maxwell E. Johnson and L. Edward Phillip; Hermeneia Commentary Series; Minneapolis: Fortress Press); The New Westminster Dictionary of Liturgy and Worship (Louisville: Westminster Press); and Eucharistic Origins (New York: Oxford University Press).